"Limerick native Prof Margaret Murnane is a visionary in her field of laser science and one of the most acclaimed research-active physicists in the US. Prof Murnane is elected to the US National Academy of Sciences. Her many achievements include designing some of the fastest lasers in the world, with the ability to pulse in the range of the low trillionths of a second. Today she continues to develop faster and more powerful laser systems. This work has enabled major advances by allowing researchers to image particles being studied in fields from physics and chemistry, to biology, medicine and technology. Just last year she was awarded the Optical Society of America’s Frederic Ives Medal/Quinn prize. The award recognizes overall distinction in optics and is the highest award given by the OSA. Prof Murnane also created a table-top affordable X-ray laser allowing the wider research community to harness the potentials of x-rays in their work. Prof Murnane, who was born and raised in County Limerick, first studied physics in University College Cork before completing her PhD at the University of California at Berkeley. 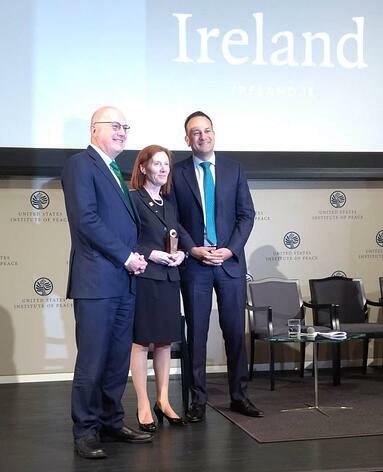 She continues to play a significant role in research and the promotion of science in Ireland, in her keen and ongoing support of the Tyndall National Institute in Cork."